CNBC: The Trump administration will immediately stop making critically important payments to insurers who sell Obamacare health plans, a bombshell move that is expected to spike premium prices and potentially lead many insurers to exit the marketplace. 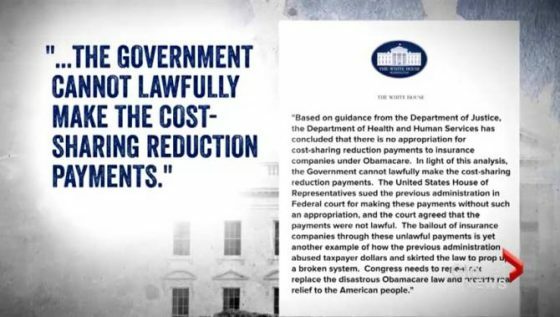 The decision to end the billions of dollars worth of so-called cost-sharing reduction (CSR) payments came after months of threats by President Donald Trump to do just that. The news came only hours after Trump signed an executive order that Obamacare advocates said could badly harm the individual insurance marketplaces. Advocates, along with insurers, health-care provider groups, patient groups and officials in many states, have expressed concerns for months that the cost-sharing reimbursements would be cut off by Trump. Senate Minority Leader Chuck Schumer, D-N.Y., sharply criticized Trump in a series of Twitter posts late Thursday. Two months ago, the Congressional Budget Office estimated that individual health plan premiums would be 20 percent higher than originally projected if the payments ceased. It also projected that premiums would be 25 percent higher than they otherwise would be by 2020, and that the federal deficit would be increased by almost $200 billion if the subsidies ended. The payments, worth $7 billion or so to insurers this year and up to $10 billion or more next year, reimburse insurers for discounts in out-of-pocket health costs they give to low-income Obamacare customers. The discounts must be offered by law. However, congressional Republicans successfully challenged in a lawsuit the Obama administration’s decision to make the reimbursement payments to insurers without getting the express budgetary authorization from Congress. Now, both California Attorney General Xavier Becerra and New York State Attorney General Eric Schneiderman said they would file lawsuits seeking to prevent Trump from ending the subsidies. The two were part of a group of 18 state attorneys general who were given permission this year to intervene in the pending appeal of the federal court decision that had ruled the payments were illegal given their lack of congressional authorization. While the Democrats are crying sabotage, they refuse to tell you that there is a legal ruling that says this funding is illegal. The Obama administration via the Treasury Department essentially stole money from various government agencies to subsidize insurance providers since Congress did not appropriate the funds. When House Republicans first came up with the idea to take the president to court nearly two years ago, they planned to sue the administration over a completely different part of Obamacare. Then-Speaker John Boehner was, as usual, facing pressure from conservatives who were frustrated at Obama’s liberal use of executive authority and their inability to derail the hated health-care law. So he and his leadership team hatched a plan to file a lawsuit accusing the president and his administration of exceeding their authority by unilaterally delaying the implementation of the employer mandate in Obamacare. The requirement that businesses with more than 50 employees provide insurance to their workers had long been a big target for Republicans and one of the more contentious policies in the law. It was the middle of the mid-term congressional campaigns, and Republicans suspected the administration was delaying the mandate to put off the political pain of compliance until after the election. “The president changed the health-care law without a vote of Congress, effectively creating his own law by literally waiving the employer mandate and the penalties for failing to comply with it,” Boehner said in a statement at the time. “That’s not the way our system of government was designed to work. No president should have the power to make laws on his or her own.” The irony was that House Republicans had repeatedly assailed the employer mandate as a jobs killer, and yet here they were suing to force the administration to implement it faster. Read more here.